I don't believe it, I think I just came up with a flavor people would want! Plus it was an accident. 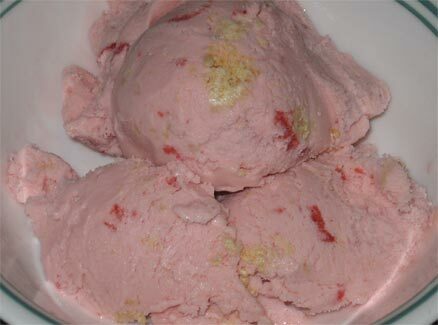 I was attempting to make my Cherry Pie Ice Cream that I was dreaming of, but the flavor just wasn't getting all the way there (probably because I ran out of sugar). So, I decided to add a smidge of strawberry to take off the edge. Well, I added too much, but it worked out for the best. My cherry pie became cherry strawberry ...cherryberry! OK, maybe I should call it Cherryberry Pie, iunno. Let's recap from the beginning. So, in a bowl goes the half and half and sugar. Decided to take the edge off by adding a bit of vanilla, but the container was almost empty (so about a 1/3 teaspoon). I then started spooning the cherry pie filling and small cherries into the bowl (avoiding the giant cherries). We then stirred the mixture for a bit. At the end I decide to squish the cherries and mix the whole thing a bit more. Into the Ice-20 the mixture went. After awhile I realized the cherry pie flavor wasn't going to make it, so i added a "small amount" (in other words, I have no idea how much I added) of strawberry syrup. Mixing continued for a bit more. I waited until the last possible minute to added the broken up crust in the hopes of keeping it as crisp as possible. I took out the mix and it was quite tasty. My daughter wanted the extra shortcake crumbs in her ice cream cup, but I ate the new flavor as is. It really hit the spot, the crust is still crunchy, and I was amazed at how well the non-fat half & half held up. Maybe there is hope for my ice cream making abilities after all! On Second Scoop: Wow, this held up well in the freezer, the shortbread pieces are still crunchy! 2 interesting points: First, the cherry flavor has spread. Second, the strawberry (syrup) flavor has mellowed. Maybe it's the real cherries versus the fake strawberry flavor, I guess it's one of those things that you learn as you go.